This Benjamin Franklin letter is one of five letters written by Franklin about his studies in electricity that made him a household name. The letters were written to his friend Peter Collinson, a member of the Royal Society in London. Collinson realized the importance of the discoveries and had them printed in a booklet called "Experiments and Observations on Electricity Made at Philadelphia in America". This book became so popular that it was reproduced more than any other book in the 18th century. 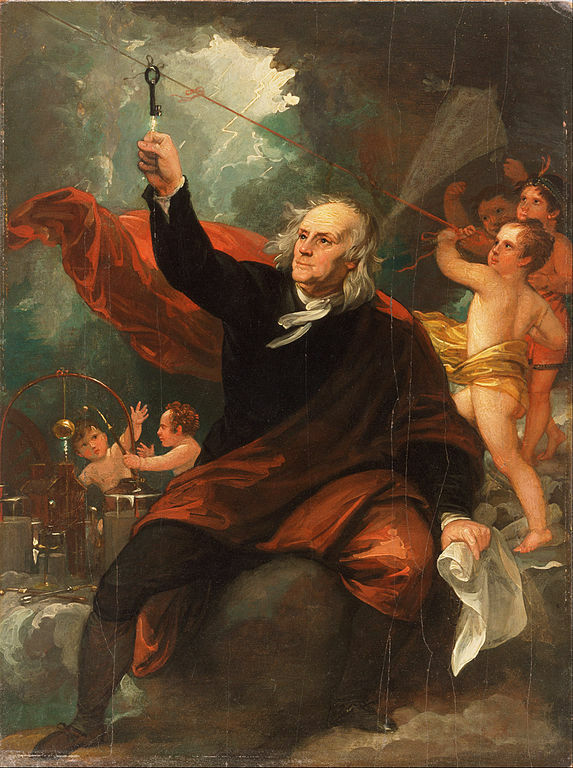 In this particular letter, Franklin talks about his experiment suspending a cork ball between two electrically charged bottles; charging a series of panes of glass, an experiment which he calls an "electrical battery;" and roasting a turkey on an electrical powered jack. You can read the rest of the letters in the series at our Benjamin Franklin and Electricity letters page. I now send you some Further Experiments and Observations in Electricity made in Philadelphia 1748. viz. 1. There will be the same Explosion and Shock if the electrified Phial is held in one Hand by the Hook, and the Coating touched by the other; as when held by the Coating and touched at the Hook. 2. To take the charged Phial safely by the Hook, and not at the same Time diminish it's Force, it must first be set down on an Electric per se. 3. The Phial will be electrified as strongly, if held by the Hook, and the Coating apply'd to the Globe, or Tube, as when held by the Coating and the Hook apply'd. 4. But the Direction of the Electrical Fire being different in Charging, will also be different in the Explosion. The bottle charged thro' the Hook will be discharged thro' the Hook. The Bottle charged thro' the Coating, will be discharged thro' the Coating and not otherwise: For the Fire must come out the same Way it went in. 5. To prove this; Take two Bottles that were equally charg'd thro' the Hooks, one in each Hand; bring their Hooks near each other, and no Spark or Shock will follow; because each Hook is disposed to give Fire, and neither to receive it. Set one of the Bottles down on Glass, take it up by the Hook, and apply it's Coating to the Hook of the other; then there will be an Explosion and Shock, and both Bottles will be discharged. 6. Vary the Experiment, by Charging two Vials equally, one thro' Hook, the other thro' the Coating: Hold that by the Coating which was charged thro' the Hook; and that by the Hook which was charged thro' the Coating. Apply the Hook of the first to the Coating of the other and there will be no Shock or Spark. Set that down on Glass, which you held by the Hook, take it up by the Coating, and bring the two Hooks together; a Spark and Shock will follow, and both Phials be discharged. In this Experiment the Bottles are totally discharged, or the Equilibrium within them restored. The Abounding of Fire in one of the Hooks (or rather in the internal Surface of one Bottle) being exactly equal to the wanting of the other: and therefore, as each Bottle has in itself the Abounding as well as the wanting, the Wanting and Abounding must be equal in each Bottle. See 8, 9, 10, 11. But if a Man holds in his Hands two Bottles, one fully electrified, the other not at all and brings their Hooks together; he has but half a Shock, and the Bottles will both remain half electrified; the one being half discharged and the other half charged. 7. Farther, Place two Vials equally charged on a Table at 5 or 6 Inches Distance; Let a Cork Ball, suspended by a Silk Thread, hang between them. If the Vials were both charg'd thro' their Hooks, the Cork, when it has been attracted and repell'd by the one, will not be attracted but equally repell'd by the other. But if the Vials were charged, the one thro the Hook and the other thro' the Coating, the Ball when it is repell'd from one Hook will be as strongly attracted by the other, and play vigorously between them, till both Vials are nearly discharg'd. 8. When we use the Terms of Charging and Discharging the Phial, 'tis in Compliance with Custom, and for want of others more suitable: since We are of Opinion, that there is really no more electrical Fire in the Phial, after what is called it's Charging than before; nor less after it's Discharging; (excepting only the small Spark that might be given to and taken from the Non-electric Matter, if separated from the Bottle, which Spark may not be equal to a 500th. Part of what is called the Explosion) For, if on the Explosion, the Electrical Fire came out of the Bottle by one Part, and did not enter in again by another; then, if a Man standing on Wax and holding the Bottle in one Hand, takes the Spark by touching the Wire Hook with the other, the Bottle being thereby discharg'd, the Man would be charg'd; or, whatever Fire was lost by one, would be found in the other; since there is no Way for it's Escape. But the Contrary is true. 9. Besides, the Vial will not suffer what is called a Charging, unless as much Fire can go out of it one Way as is thrown in by another. A Phial can not be charged, standing on Wax, or Glass, or hanging on the prime Conductor, unless a Communication be form'd between it's Coating and the Floor. 10. But suspend two or more Phials on the prime Conductor, one hanging to the Tail of the other, and a Wire from the last to the Floor: an equal Number of Turns of the Wheel shall charge them all equally; and every one as much as one alone would have been. What is driven out at the Tail of the first, serving to charge the second; what is driven out of the second charging the third, and so on. By this Means, a great Number of Bottles might be charged with the same Labour, and equally high with one alone, were it not that every Bottle receives new Fire and loses it's old with some Reluctance, or rather gives some small Resistance to the Charging, which in a Number of Bottles becomes more equal to the Charging Power, and so repels the Fire back again on the Globe, sooner than a single Bottle would do. 11. When a Bottle is charg'd in the common Way, it's inside and outside Surfaces stand ready, the one to give Fire by the Hook, the other to receive it by the Coating: The one is full and ready to throw out, the other empty and extreamly hungry: yet as the first will not give out, unless the other can at the same Instant receive in; so neither will the latter receive in, unless the first can at the same Instant give out. When both can be done at once, 'tis done with inconceivable Quickness and Violence. 12. So a strait Spring (tho' the Comparison does not agree in every Particular) when forcibly bent, must, to restore itself contract that Side, which in the bending was extended, and extend that which was contracted; if either of these two Operations be hindered, the other can not be done. But the Spring is not said to be charged with Elasticity when bent, and discharg'd when unbent; it's Quantity of Elasticity is always the same. 13. Glass, in like Manner, has, within it's Substance always the same Quantity of Electrical Fire; and that, a very great Quantity in Proportion to the Mass of Glass, as shall be shewn hereafter. 26. 14. This Quantity, proportioned to the Glass, it strongly and obstinately retains, and will neither have more nor less; tho it will suffer a Change to be made in it's Parts and Situation; that is, We may take away Part of it from one of the Sides, provided we throw an equal Quantity into the other. 15. Yet when the Situation of the Electrical Fire is thus altered in the Glass, when some has been taken from one Side, and some added to the other; it will not be at Rest or in its natural State, till ’tis restored to it's original Equality. And this Restitution can not be made thro the Substance of the Glass, but must be done by a Non-electric Communication formed without, from Surface to Surface. 16. Thus the whole Force of the Bottle and Power of giving a Shock, is in the Glass itself; the Non-electrics in Contact with the two Surfaces serving only to give and receive to and from the several Parts of the Glass; that is, to give on one Side, and take away from the other. 17. This was discovered here in the following Manner. Purposing to analize the electrified Bottle, in Order to find where it's Strength lay; we placed it on Glass, and drew out the Cork and Wire, which, for that Purpose, had been loosly put in. Then taking the Bottle in one Hand, and bringing a Finger of the other near its Mouth, a strong Spark came from the Water, and the Shock was as violent as if the Wire had remained in it; which shew'd that the Force did not lie in the Wire. Then to find if it resided in the Water, being crowded into and condensed in it, as confined by the Glass; which had been our former Opinion; we electrified the Bottle again, and placing it on Glass, drew out the Wire and Cork as before, then taking up the Bottle, we decanted all its Water into an empty Bottle, which likewise stood on Glass; and taking up that other Bottle, we expected, if the Force resided in the Water, to find a Shock from it; but there was none. We judged then, that it must either be lost in Decanting, or remain in the first Bottle. The latter we found to be true: For that Bottle on Trial gave the Shock, tho' filled up as it stood with fresh unelectrify'd Water from a Tea Pot. To find then whether Glass had this Property merely as Glass, or whether the Form contributed any Thing to it; we took a Pane of Sash Glass, and laying it on the Hand, placed a Plate of thin Lead on it's upper Surface; then electrified that Plate, and bringing a Finger to it, there was a Spark and Shock. We then took two Plates of Lead of equal Dimensions, but less than the Glass by the Inches every Way, and electrified the Glass between them, by electrifying the uppermost Lead; then separated the Glass from the Lead; in doing which, what little Fire might be in the Lead was taken out; and the Glass being touched in the electrified Part with a Finger, afforded only very small pricking Sparks, but a great Number of them might be taken from different Places. Then dextrously placing it again between the Plates of Lead, and completing the Circle between the two Surfaces, a violent Shock ensu'd. Which demonstrated the Power to reside in the Glass as Glass; and that the Non-electrics in Contact served only like the Armature of the Loadstone, to unite the Forces of the several Parts, and bring them at once to any Point desired. It being a Property of a Nonelectric, that the whole Body instantly receives or gives what Electrical Fire is given to or taken from any one of its Parts. 18. Upon this We made what we call'd an Electrical Battery, consisting of eleven Panes of large Sash Glass, arm'd with thin leaden Plates, pasted on each Side, placed vertically, and supported at two Inches Distance on Silk Cords; with Hooks of thick Leaden Wire one from each Side standing upright, distant from each other; and convenient Communications of Wire and Chain from the giving Side of one Pane to the receiving Side of the other; that so the whole might be charg'd together, and with the same Labour as one single Pane; and another Contrivance to bring the giving Sides, after charging in Contact with one long Wire, and the Receiver with another; which two long Wires would give the Force of all the Plates of Glass at once thro' the Body of any Animal forming the Circle with them. The Plates may also be discharg'd separately, or any Number together that is required. But this Machine is not much used, as not perfectly answering our Intention with Regard to the Ease of Charging, for the Reasons given 10. We made also, of large Glass Panes, Magical Pictures, and self moving animated Wheels, presently to be described. 19. I perceive by the ingenious Mr. Watson's last Book, lately received, that Dr. Bevis had used Panes of Glass to give a Shock before us; tho' till the Book came to Hand, I thought to have communicated it to you as a Novelty. The Excuse for mentioning it here, is, that we try'd the Experiment differently, drew different Consequences from it (for Mr. Watson still seems to think the Fire accumulated on the Non-electric that is in Contact with the Glass pag. 72) and, as far as we hitherto know, have carry'd it further. 20. The Magical Picture is made thus. Having a large Mezzotinto with a Frame and Glass (Suppose of the King, God preserve him) Take out the Print, and cut a Pannel out of it, near two Inches all round distant from the Frame; if the Cut is thro' the Picture, 'tis not the Worse. With thin Paste or Gum Water, fix the Border, that is cut off, on the inside of the Glass, pressing it smoothe and close; then fill up the Vacancy by Gilding the Glass well with Leaf Gold or Brass; gild likewise the inner Edge of the Back of the Frame all round except the Top Part, and form a Communication between that Gilding and the Gilding behind the Glass: then put in the Board, and that side is finished. Turn up the Glass, and gild the foreside exactly over the Back Gilding; and when this is dry, cover it by pasting on the Pannel of the Picture that had been cut out, observing to bring the corresponding Parts of the Border and Picture together; by which the Picture will appear of a Piece as at first, only Part is behind the Glass and Part before. Hold the Picture horizontally by the Top, and place a little moveable gilt Crown on the Kings Head. If now the Picture be moderately electrified, and another Person take hold of the Frame with one Hand, so that his Fingers touch it's inside Gilding, and with the other Hand endeavour to take off the Crown, he will receive a terrible Blow and fail in the Attempt. If the Picture were highly charg'd, the Consequence might perhaps be as fatal as that of High Treason: For when the Spark is taken thro' a Quire of Paper laid on the Picture, by Means of a Wire Communication, it makes a fair Hole thro' every Sheet; that is thro' 48 Leaves (tho' a Quire of Paper is thought good Armour against the Push of a Sword, or even against a Pistol Bullet) and the Crack is exceeding loud. The Operator, who, to prevent its falling, holds the Picture by the upper End, where the inside of the Frame is not gilt, feels Nothing of the Shock, and may touch the Crown without Danger, which he pretends is a Test of his Loyalty. If a Ring of Persons take a Shock among them the Experiment is called the Conspiracy. 21. On the Principle in 7. That the Hooks of Bottle, differently charged, will attract and repel differently, is made an electrical Wheel, that turns with considerable Strength. A small upright Shaft of Wood passes at right Angles thro' a thin round Board of about a Foot Diameter, and turns on a sharp Point of Iron, fixt in the lower End, while a strong Wire in the upper End, passing thro' a small Hole in a thin Brass Plate, keeps the Shaft truly vertical. About 30 Radii of equal Length made of Sash Glass, cut in narrow Strips, issue Horizontally from the Circumference of the Board; the Ends most distant from the Center being about 4 Inches apart. On the End of every one, a Brass Thimble is fixt. If now the Wire of a Bottle, electrified in the Common Way, be brought near the Circumference of this Wheel, it will attract the nearest Thimble, and so put the Wheel in Motion: That Thimble, in passing by, receives a Spark, and thereby being electrified is repell'd and so driven forwards, while a second, being attracted, approaches the Wire, receives a Spark and is driven after the first; and so on till the Wheel has gone once round, when the Thimbles, before Electrified, approaching the Wire, instead of being attracted, as they were at first, are repell'd; and the Motion presently ceases. But if another Bottle, which had been charg'd thro' the Coating be placed near the same Wheel, it's Wire will attract the Thimbles repell'd by the first, and thereby doubles the Force that carries the Wheel round; and not only, taking out the Fire that had been communicated to the Thimbles by the first Bottle, but even robbing them of their natural Quantity, instead of being repell'd when they come again towards the first Bottle, they are more strongly attracted: so that the Wheel mends its Pace till it goes with great Rapidity, 12 or 15 Rounds in a Minute; and with such Strength, as that the Weight of 100 Spanish Dollars, with which we once loaded it, did not seem in the least to retard it's Motion. This is called an Electrical Jack; and if a large Fowl were spitted on the upright Shaft, it would be carried round before a Fire with a Motion fit for Roasting. 22. But this Wheel, like those driven by Wind, Water or Weights, moves by a foreign Force, viz. that of the Bottles. The Selfmoving Wheel, tho constructed on the same Principles, appears more surprizing. 'Tis made of a thin round Plate of Window Glass, 17 Inches Diameter, well gilt on both Sides, all but two Inches next the Edge. Two small Hemispheres of Wood are then fixt with Cement to the Middle of the upper and under Sides, centrally opposite, and in each of them a thick strong Wire 8 or 10 Inches long, which together make the Axis of the Wheel. It turns horizontally on a Point at the lower End of it's Axis which rests on a Bit of Brass, cemented within a Glass Salt-Seller. The upper End of it's Axis passes thro' a Hole in a thin Brass Plate, cemented to a long strong Piece of Glass, which keeps it 6 or 8 Inches Distant from any Non-electric, and has a small Ball of Wax or Metal on its Top to keep in the Fire. In a circle on the Table, which supports the Wheel, are fixt 12 small Pillars of Glass, at about 4 Inches Distance, with a Thimble on the Top of each. On the Edge of the Wheel is a small leaden Bullet, communicating by a Wire with the Gilding of the upper Surface of the Wheel: and about 6 Inches from it, is another Bullet, communicating in like Manner with the under Surface. When the Wheel is to be charg'd by the upper Surface, a Communication must be made from the under Surface to the Table. When it is well chargd it begins to move; the Bullet nearest to a Pillar, moving towards the Thimble on that Pillar; and passing by, electrifies it, and then pushes itself from it: The succeeding Bullet, which communicates with the other Surface of the Glass, more strongly attracting that Thimble, on Account of it's being before electrified by the other Bullet: and thus the Wheel increases it's Motion, till it comes to such a Height, as that the Resistance of the Air regulates it. It will go half an Hour, and make, one Minute with another, 20 Turns in a Minute; which is 600 turns in the whole: The Bullet of the upper Surface giving in each Turn 12 Sparks to the Thimbles, which makes 7200 Sparks, and the Bullet of the under Surface receiving as many from the Thimbles: these Bullets moving in the Time, near 2500 Feet. The Thimbles are well fixt, and in so exact a Circle, that the Bullets may pass within a very small Distance of each of them. If instead of 2 Bullets, you put 8, 4 communicating with the upper Surface, and four with the under Surface, placed alternately; which 8, at about 6 Inches Distance completes the Circumference; the Force and Swiftness will be greatly increased; the Wheel making 50 Turns in a Minute; but then it will not go so long. These Wheels may perhaps be apply'd to the Ringing of Chimes and Moving Orreries. 23. A small Wire bent circularly, with a loop at each End; Let one End rest against the under Surface of the Wheel, and bring the other End near the upper Surface, it will give a terrible Crack; The Force will be discharg'd, and the Wheel will stop. 24. Every Spark drawn in that Manner from the Surface of the Wheel, makes a round Hole in the Gilding, tearing off a Part of it in coming out; which shews that the Fire is not accumulated on the Gilding, but is in the Glass itself. 25. The Gilding being varnished over with Turpentine Varnish; the Varnish, tho' dry and hard, is burnt by the Spark drawn thro' it, gives a strong Smell and visible Smoke. And when the Spark is drawn thro' Paper, all round the Hole made by it, the Paper will be blackt by the Smoke, which Sometimes penetrates several of the Leaves. Parts of the Gilding, torn off, are also found forcibly driven into the Hole made in the paper by the Stroke. 26. 'Tis amazing to observe in how small a Portion of Glass a great Electrical Force may lie. A thin Glass Bubble about an Inch Diameter, weighing only six Grains, being half filled with Water, partly gilt on the outside, and furnished with a Wire Hook, gives when electrified, as great a Shock as a Main is willing to bear. As the Glass is thickest near the Orifice, I suppose the lower half, which being gilt, was electrified, and gave the Shock, did not exceed two Grains; for it appeard, when broke, much thinner than the upper half. If one of these thin Bottles be electrified by the Coating, and the Spark taken out thro the Gilding, it will break the Glass inwards, at the same Time that it breaks the Gilding outwards. 27. And allowing, for the Reasons before given 8, 9, 10, that there is no more Electrical Fire in a Bottle after Charging than before, how great must the Quantity be in this small Portion of Glass! It seems as if it were of its very Substance and Essence. Perhaps if that due Quantity of Electrical Fire, so obstinately retain'd by Glass, could be separated from it, it would no longer be Glass, it might loose it's Transparency, or its Fragility, or Elasticity. Experiments may possibly be invented hereafter to discover this. 28. We are surprized at the Account given in Mr. Watson's Book, of a Shock communicated thro' a great Space of dry Ground, and suspect some metalline Quality in the Gravel of the Ground: having found, that simple dry Earth ramm'd in a Glass Tube open at both Ends, and a Wire Hook inserted in the Earth at each End; the Earth and Wires making Part of a Circle, would not conduct the least perceptible Shock. And indeed when one Wire was electrified, the other hardly shew'd any Signs of its being in Connexion with it. Even a thoroughly wet Packthread sometimes fails of conducting a Shock, tho' it otherwise conducts Electricity very well. A dry Cake of Ice, or an Iceicle, held between two Persons in a Circle, likewise prevents the Shock, which one would not expect, as Water conducts it so perfectly well. Gilding on a new Book, tho' at first it conducts the Shock extreamly well; yet fails after 10 or a Dozen Experiments; tho' it appears otherwise in all Respects the same; which we can not account for. 29. There is one Experiment more, which surprizes us, and is hitherto not satisfactorily accounted for. It is this. Place an Iron Shot on a Glass Stand, and let a damp Cork Ball, suspended by a Silk Thread hang in Contact with the Shot. Take a Bottle in each Hand, one that is electrified thro' the Hook, the other thro' the Coating. Apply the giving Wire to the Shot, which will electrify it positively, and the Cork shall be repell'd. Then apply the requiring Wire, which will take out the Spark given by the other, when the Cork will return to the Shot. Apply the same again, and take out another Spark, so will the Shot be electrified negatively, and the Cork in that Case shall be repell'd equally as before. Then apply the giving Wire, and give to the Shot the Spark it wanted, so will the Cork return: Give it another, which will be an Addition to it's natural Quantity, so will the Cork be repell'd again; And so may the Experiment be repeated, as long as there is any Charge remaining in the Bottles; Which shews that Bodies, having less than the common Quantity of Electricity, repel each other, as well as those that have more. Chagrin'd a little that We have hitherto been able to discover Nothing in this Way of Use to Mankind, and the hot Weather coming on, when Electrical Experiments are not so agreable; 'tis proposed to put an End to them for this Season somewhat humorously in a Party of Pleasure on the Banks of SchuylKill, (where Spirits are at the same Time to be fired by a Spark sent from Side to Side thro' the River). A Turky is to be killed for our Dinners by the Electrical Shock; and roasted by the electrical Jack, before a Fire kindled by the Electrified Bottle; when the Healths of all the Famous Electricians in England, France and Germany, are to be drank in Electrified Bumpers, under the Discharge of Guns from the Electrical Battery.